President Emanuel Macron hasn’t lost anytime in building up on his decisive victory over the far-right populist candidate Marine LePen in France’s recent presidential election. The youngest French head of state since Emperor Napoleon (his emerging moniker is “Le Kid”), his improbable run from a colorless technocrat to charismatic up-ender of the French political establishment took a little over a year. His next hurdle is the French legislative election at the end of June. He is benefitting from defections from the major parties of both the left and the right. The most recent polls show that his “La Republique en Marche” (LRAM) newly branded political party is poised to gain a majority of the seats of the “Assemblée Nationale” (French parliament) by putting together a coalition of centrist voters. President Macron has an ambitious agenda of economic reforms. 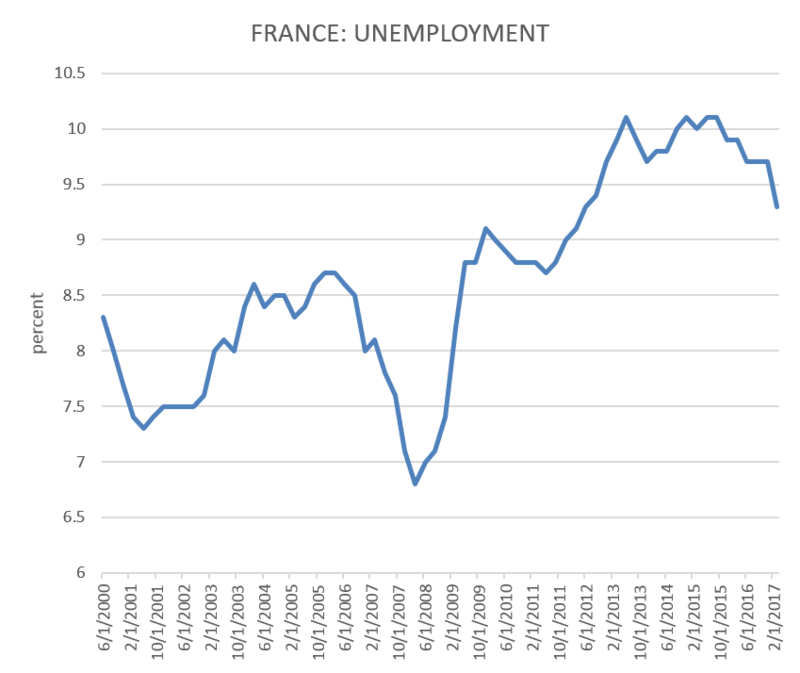 First, reforming France’s famously rigid labor markets. Second, shrink the economic role of the state (state expenditures account for almost 60% of GDP). And third, promoting entrepreneurship and innovation. 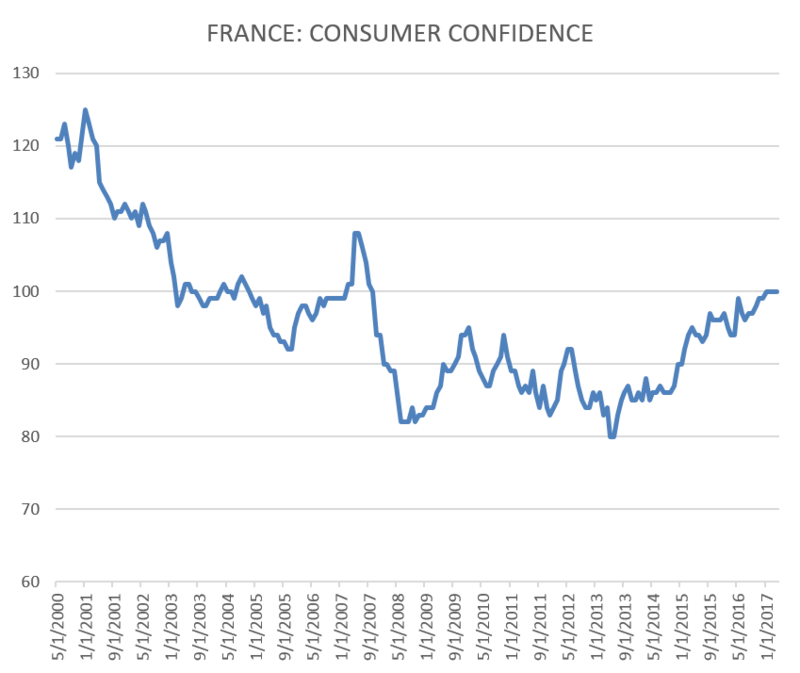 While previous governments have tried, and failed, at similar economic reforms, Macron’s task may be made easier by the improved economic background, as well as a public awareness of the need for radical change to get France out of its economic rut. In the past few months, economic indicators have been positive. 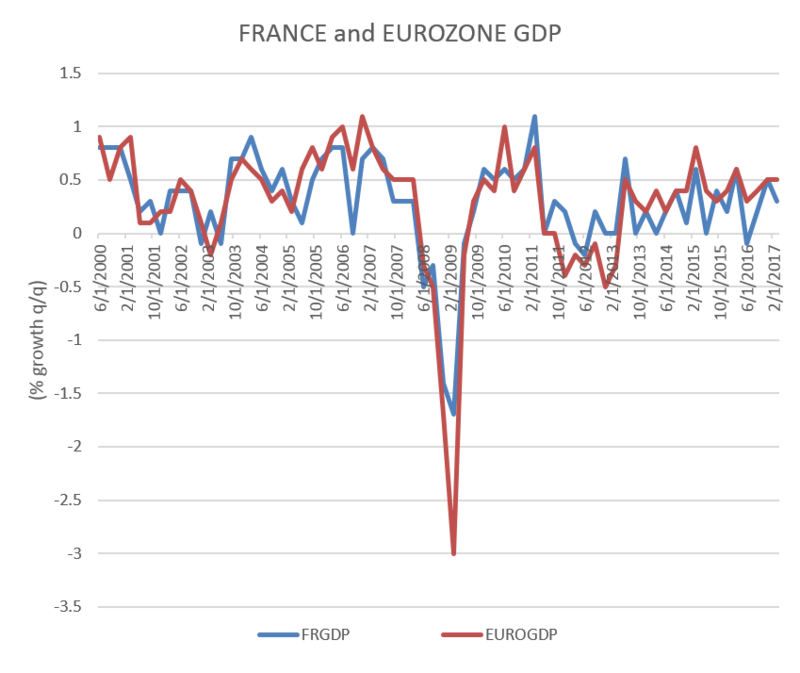 The French economy has been growing steadily for the past three quarters (albeit at a slower the than the Eurozone average). Economic output was up 0.3% (quarter-on-quarter, q/q) in 1Q17, Final Demand was up 0.9% q/q over the same period. 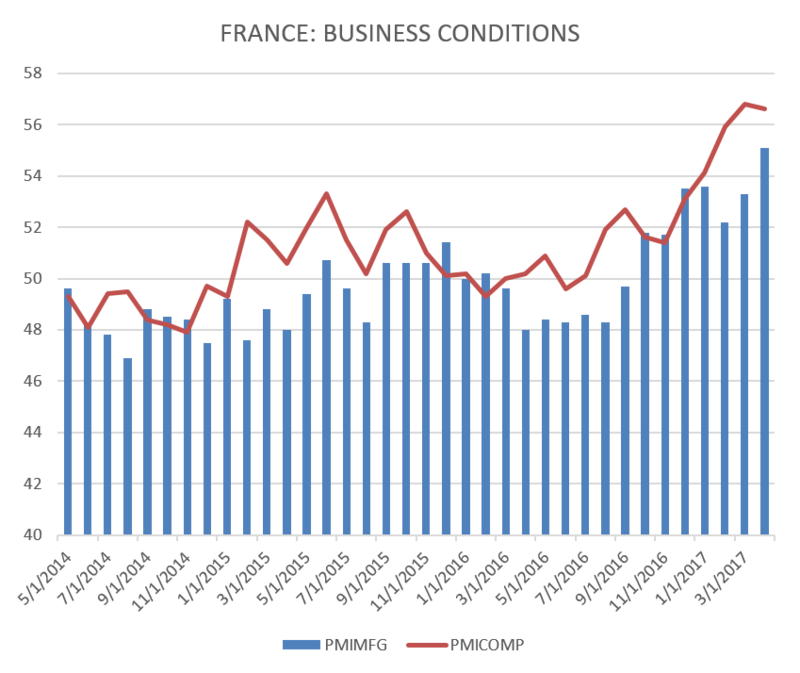 Business conditions, as measured by the PMI-Manufacturing and PMI-Composite, have been steadily rising in the past 12 months, and Consumer Confidence is at its highest point since the financial crisis of 2008. While unemployment remains high at 9.3%, it has come down from a peak of 10.1% in September 2012. The financial markets have also been buoyant, with the stock market index CAC-40 up 33% in the past 12-months and 9.7% since the beginning of the year. However, this is not to say that France will adopt a U.S-Style free market economy. Macron’s economic program has greater similarity to the Nordic or German economic model, combining some degree of deregulation and tax cuts with a strong safety net and an important role for the state. In particular, his focus will be on labor market reform, which currently area combination of entrenched interests of long-time employees, who essentially cannot be fired, and an increasing proportion of workers on short-term and precarious short-term contracts. Macron wants to change the focus of the labor markets on the workers, not the jobs, through a dual path of increasing the flexibility of the labor markets, while providing workers with more training and education. Such reforms have been tried in the past, but failed in the face of street protests and strikes organized by powerful labor unions. However, Macron benefits from momentum, and has also started a process of consultations with the unions and business groups. Macron is also a committed Europeanist, and ran as one against the aggressive anti-EU and nationalism of Marine LePen’s Front National. His first trip as president on the day after the election was to Germany, with the goal of reviving the Franco-German leadership of the EU. However, his vision of Europe is starkly different from that of Germany’s Angela Merkel. On one hand, Macron wants to deepen European economic integration, with a true mechanism of fiscal transfers, and the issuance of sovereign bonds at the eurozone level. On the other, Germany continues to be wary of any program that would increase EU-wide burden sharing. Furthermore, Macron is pushing for a greater role for fiscal policy, while the Merkel/Schauble team continues to promote fiscal balance. Macron’s first ventures on the international scene (the NATO Summit and the G-7 meeting in Taormina) strengthened his position at home and in Europe. He successfully pushed back on President Trump (the famous handshake) and established himself as a confident co-leader of the EU (alongside with German Chancellor Merkel. This said, Macron will have a very short honeymoon. The French public is famously conservative and resistant to change. Furthermore, the new president will have to deal with significant structural problems, including high levels of youth unemployment, regional economic disparities and strong populist and anti-globalization pressures. Furthermore, the Franco-German tandem faces major challenges at the EU level. First of all, they need to come up with a common vision. Secondly, both the French and German recipes for Europe are flawed. The EU probably needs less integration, not more, and it also needs looser purse strings. Nevertheless, Macron’s election is the result the disruption of the established order, and this gives him a unique chance to succeed where others have failed.